It’s no secret the restaurant industry is rapidly changing, largely driven by evolving consumer preferences. Not only have millennial preferences dictated which food restaurants offer, but millennials have also changed how consumers get that food – whether that entails in-restaurant dining, or increasingly, delivery, pick-up windows and drive-thrus. Motivated by convenient and easy ordering, fast service and immersive experiences, today’s consumer demands more from restaurants than just great food. In order to bring new guests into your restaurant – and keep them as part of your loyal, returning client base – you’ll need to create an unparalleled guest experience that markets itself. Colorful and eye-catching digital signage, like custom digital menu boards and displays, significantly improves guest experience at restaurants. By placing bright digital menus outside the entrance, full-service restaurants attract curious consumers and introduce them to their food before guests even set foot in the door. Simultaneously driven by efficiency and convenience, your potential guest will appreciate the opportunity to glance over your menu before being seated. Digital menu boards are also particularly useful for quick-service restaurants, where on-the-go consumers value any feature that shortens their wait time. Since large, bright digital menus are easier to read, guests can more efficiently spot menu items, prices, specials and any additional details they’ll need before ordering. Not only does this send the guest’s order to the kitchen more quickly, but it also pushes guests through the queue faster – ultimately reducing every guest’s wait time. Your menu isn’t the only part of your restaurant that needs to be easily navigated. Guests should also be able to quickly find their way through your restaurant – whether they’re looking for a restroom, dining room, coat check or entrances and exits. Directional and wayfinding signage is the easiest way to ensure your guests are able to locate other important areas of your restaurant, particularly if your layout is more complex. On-brand themed wayfinding signs can also serve to enhance your overall aesthetic, while pointing guests in the right direction. When you’re in the hospitality industry, you know guest experience goes beyond just convenience and speed of service. At your restaurant, you’ve worked hard to create a cohesive, inviting atmosphere that matches your brand personality, as well as your food. And, for dine-in guests, the experience is almost more important than the dish. Now more than ever, consumers are prioritizing experiences over material goods – and they’re much more willing to pay for that experience. 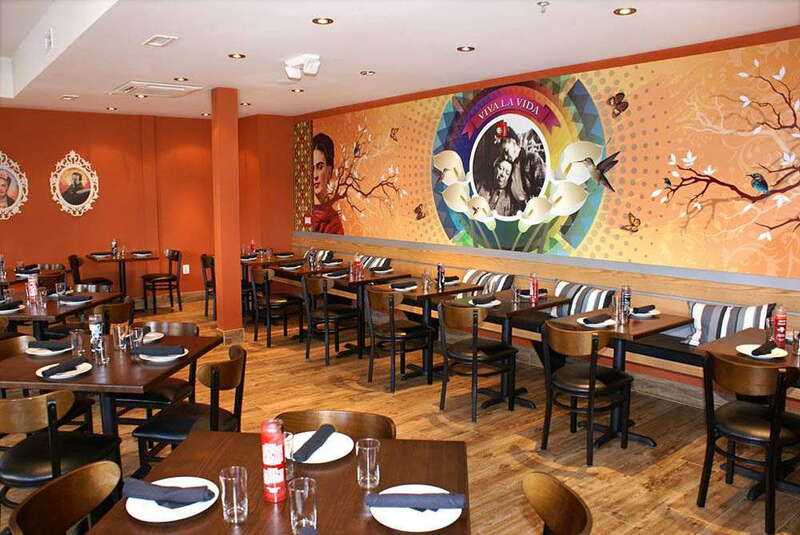 While undergoing a full restaurant redesign may not be in your budget, you can easily – and cost-effectively – update your environment with wall murals. Wide-format wall murals in luscious, living color make a big splash in a dining room or behind a bar, adding color and context to any environment. Or, if you’re looking to completely transform your atmosphere, experiential and environmental graphics present the perfect solution. These visuals can turn your environment into anything from a lush forest to a pop-up that transports guests to an iconic TV show hangout, like Moe’s Tavern from The Simpson’s. Creating a memorable experience for guests, both in atmosphere and service offerings, has become an integral strategy for successful restaurants. And, as positive online reviews and peer recommendations continue to be the main drivers of restaurant demand, it could make a marked impact on your overall revenue, too. By partnering with the right large-scale graphics and signage provider, you’ll be able to merge form and function for a second-to-none guest experience in your restaurant. Digital menu boards and bright displays help send to-go orders out the door quickly, while directional and wayfinding signage helps guests easily navigate your restaurant. Meanwhile, wide-format display graphics like murals instantly upgrade and transform your environment for an immersive, picture-perfect dining experience. Whether your guests are seeking a leisurely sit-down meal or need a to-go order in a hurry, the right signage and restaurant ambiance will go a long way in ensuring a positive experience.